This paper by Clairton F. de Souza, Michael Kalloniatis, Philip J. Polkinghorne, Charles N.J. McGhee, Monica L. Acosta examines glutamate receptors and their functional activation in the human retina. Glutamate is the major excitatory neurotransmitter in the vertebrate retina and those excitatory neurons in the retina rely on a host of receptors to detect glutamate and transduce that detection into a neuronal signal. These receptors are α-amino-3-hydroxyl-5-methylisoxazole-4-propionic acid (AMPA), kainic acid (KA) and N-methyl-d-aspartate (NMDA) receptors. Through the use of 1-amino-4-guanidobutane; AGB, it is possible to functionally characterize the expression of ionotropic glutamate receptors. 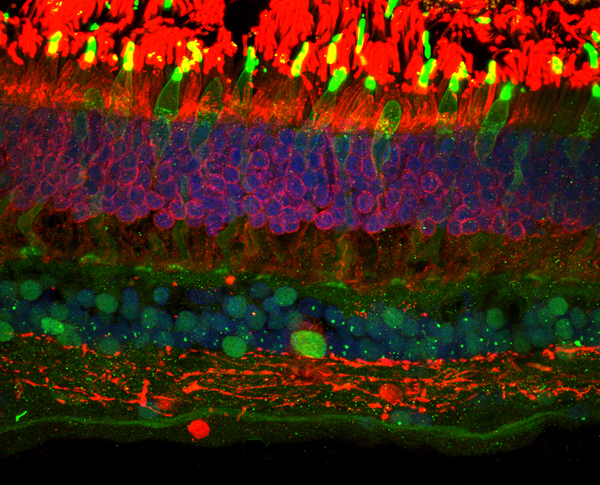 The image above is a section of normal human retina. L/M Cone photoreceptors and bipolar cells (Alexa 488; green) are shown in the outer and inner nuclear layers, respectively and a few ganglion cells are also seen. Rod photoreceptors (Alexa 594; red) are labelled in the outer retina, whereas a dopaminergic amacrine cell (Alexa 594; red) is observed with its connections in the inner plexiform layer. Cell nuclei are labelled with DAPI (blue). Images were collected at 60x magnification on Olympus FV1000 confocal microscope.